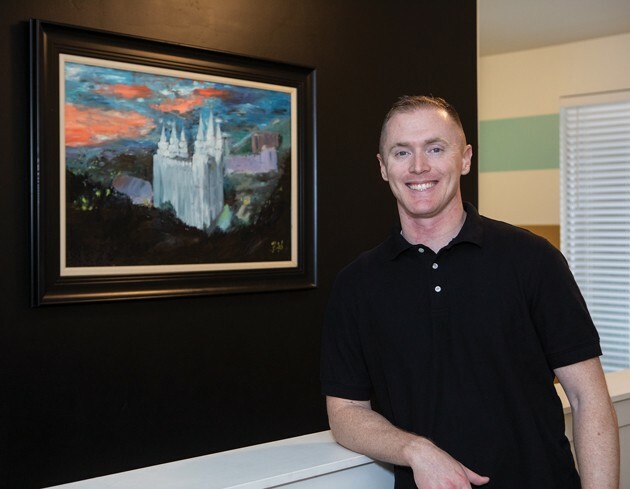 Bryan Lutz stands in front of an oil painting of the Salt Lake Temple. He found the old print in a dumpster and painted over it. 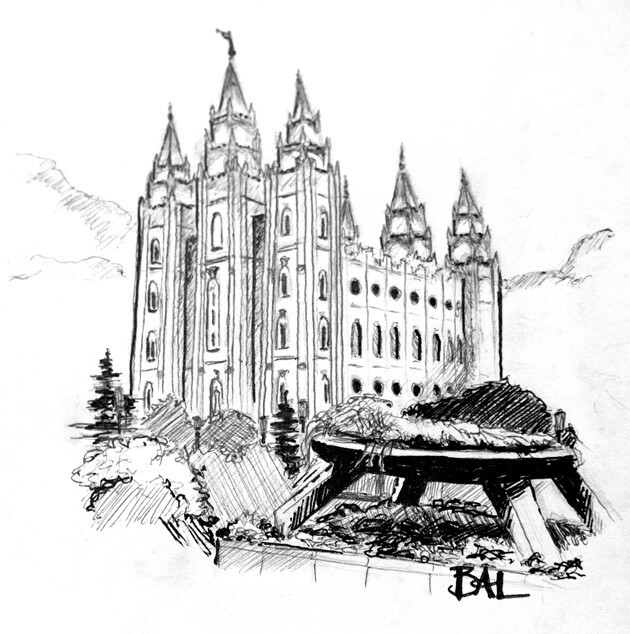 Bryan Lutz’ sketch of the Salt Lake Temple. 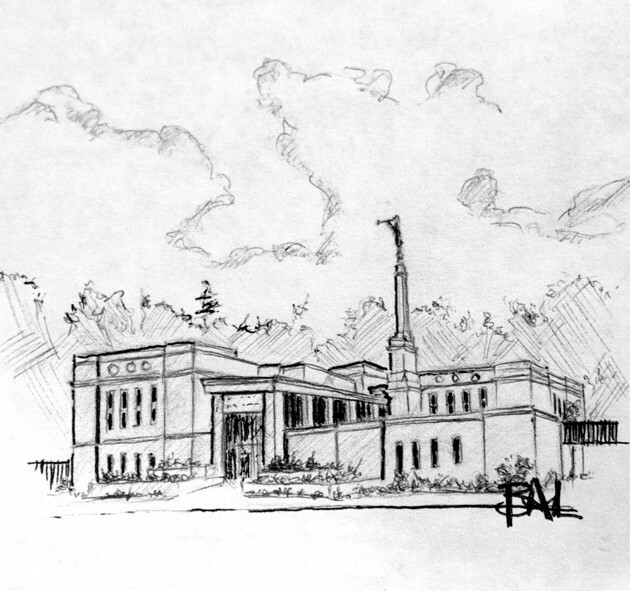 Bryan Lutz’ sketch of the Anchorage, Alaska Temple. 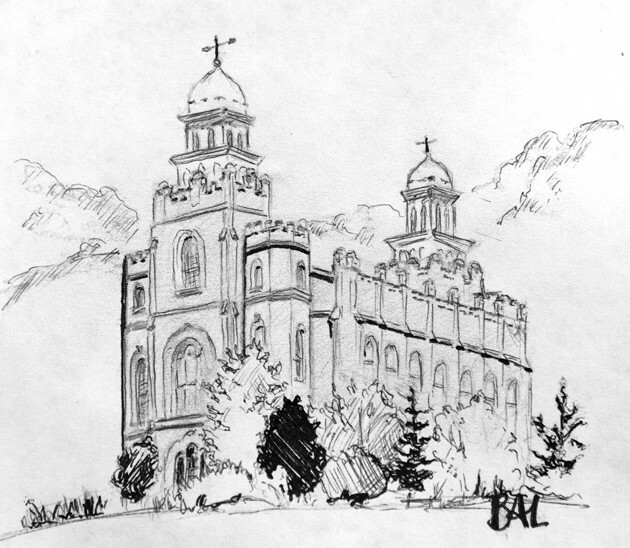 Bryan Lutz’ sketch of the Logan Temple. Lutz works on a painting in his Stansbury home and prepares paints before working on a piece in progress. 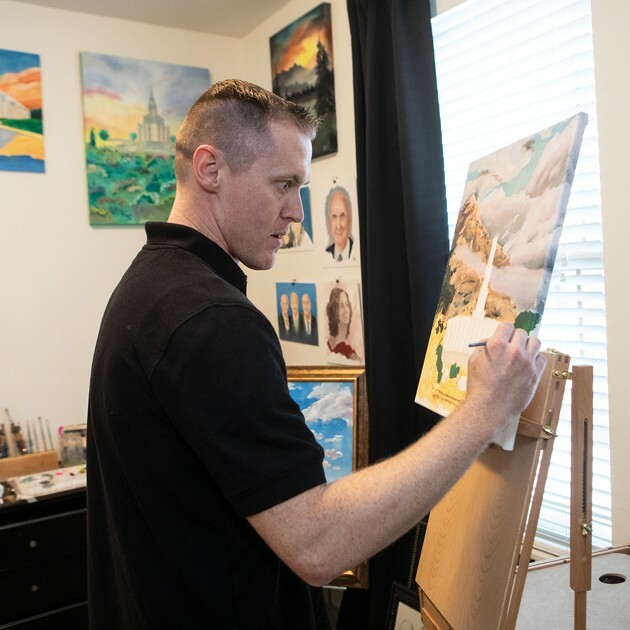 He paints as a way to decompress from the stress of working as a police officer. 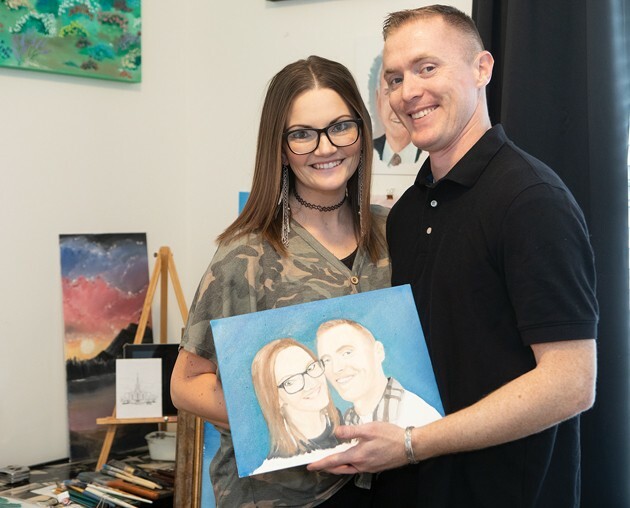 He and wife, Becky, hold a painting of the couple. Having served in the military for over 15 years, and now as a police officer, 33-year-old Bryan Lutz finds joy in serving others. But there’s another joy that he’s passionate about: painting and drawing. Lutz’s love of art started when he was very young. 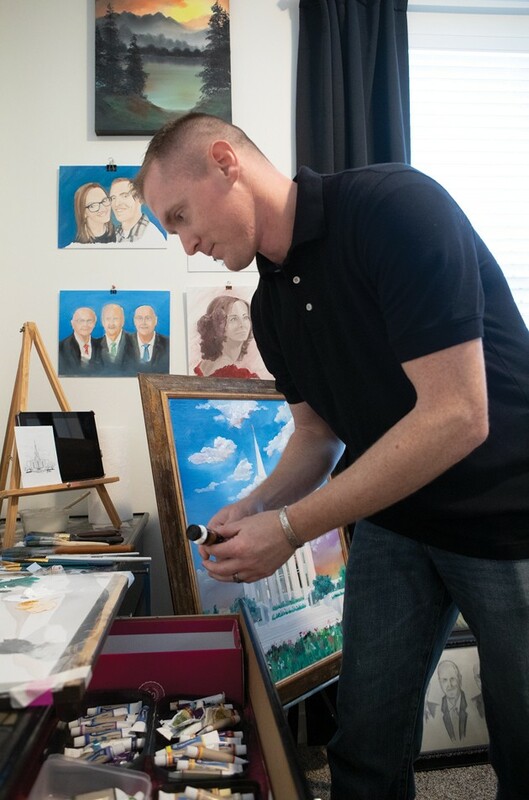 After graduating from high school, Lutz began attending the Art Institute in Draper when he was deployed to Iraq for 545 days starting in 2005. He was single and the deployment seemed to go quickly, he said. 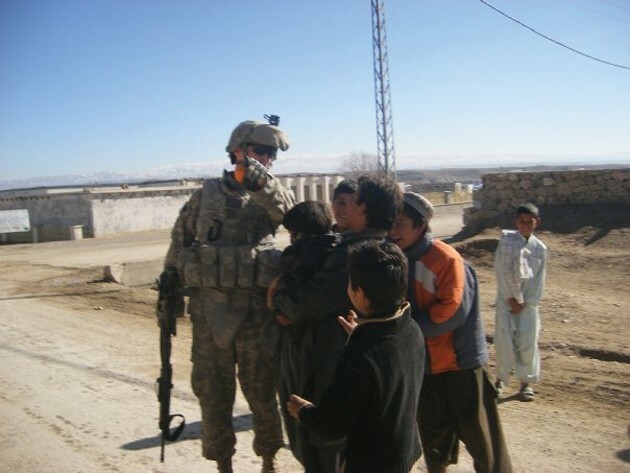 His next deployment, three years later, was to Afghanistan. Now married, he had to leave his pregnant wife home. Lutz returned to the states during his deployment for two weeks to see his baby girl born, and then returned to Afghanistan to finish his nine-month tour. While in Afghanistan, he told his wife, Becky, over the phone, that he was thinking of pursuing a job as a police officer after he returned. Lutz struggled with the idea of designing someone else’s buildings. He had enjoyed serving people in Iraq and Afghanistan, and couldn’t picture himself trapped behind a desk. Although he missed his family, Lutz enjoyed his service in a foreign land. “Even though I couldn’t speak their language, I liked helping them,” he said. 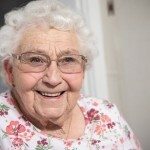 The idea of continuing his service at home crossed his mind. 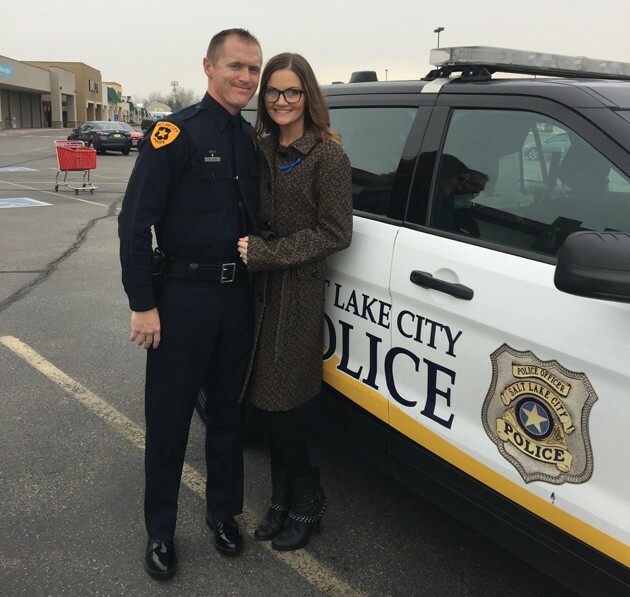 After thinking about it for a few days, Becky Lutz talked again with her husband and decided that becoming a police officer was what he was meant to do. Lutz returned home, but never finished his schooling at the art institute. 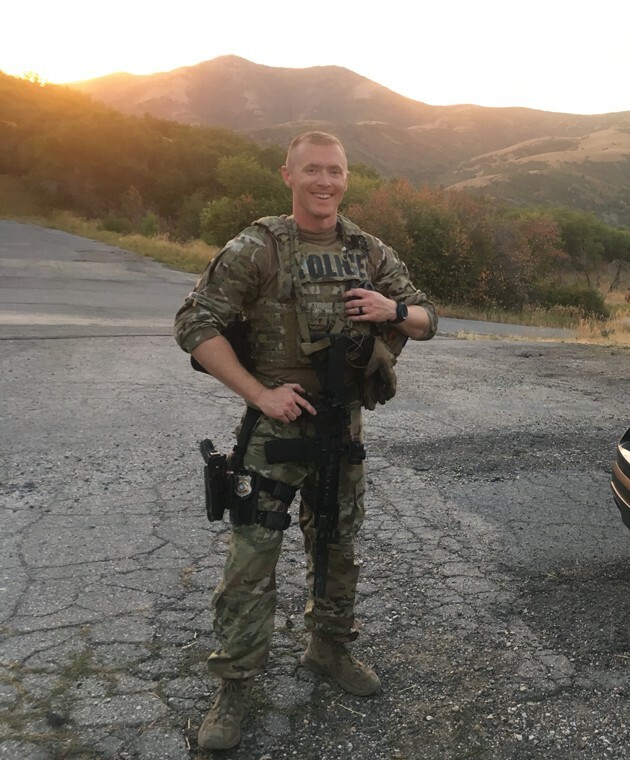 But he did enroll at the Salt Lake Community College Police Academy and graduated in 2012. While serving as a police officer, Lutz has seen hard days. On many occasions he unwinds by drawing or painting in his home. 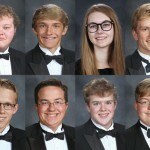 Lutz plans to draw all the temples of the Church of Jesus Christ of Latter-day Saints. Currently, there are 166 around the world. He doesn’t have an order, but does look at a list and decides which one to draw and add his own artistic view. “The temple drawings started by just doodling at church,” he said. He has discovered that a lot of the temples are similar and enjoys finding fun facts about each temple he is drawing. Lutz realizes he won’t be able to go visit every temple, but this is a way he can see them. Each sketch is about the size of an index card and Lutz plans on drawing about four a week. They can take anywhere from 30 minutes to three hours to complete. Another one of Lutz’s artworks is an oil painting of a picture his wife took of their oldest daughter, Brielle, when she was eight years old. Bryan recently finished the painting. “I’m super critical of drawing people that I love because I want them to like it,” Lutz said. He knew Brielle loved the oil painting, because as soon as she ran into the room and saw it, she began to cry. Lutz plans on painting his other two children when they turn eight. This spring, Lutz wants to get out and paint scenery from around Tooele County. 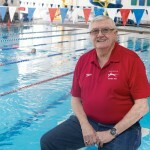 Growing up in Kearns, Lutz didn’t have the open atmosphere like the small-town uniqueness he has found in Stansbury Park. Recently, Lutz’s neighborhood held a neighborhood clean-up day. A big dumpster was provided and neighbors were de-junking their homes. Lutz and his wife noticed that the dumpster was starting to over fill. They decided to go arrange the junk in the dumpster so other neighbors could add to the pile. A black frame caught Lutz’s eye. He decided to take the standard picture in the frame and create an oil painting over the top. His wife carried the painting home. Lutz painted the Salt Lake Temple and filmed a time-lapse movie, which he posted on his Instagram page. The painting now hangs in their hallway as you enter their home. “I’m really thankful someone threw it away,” Lutz said. Another piece of artwork Lutz created was painting over the top of a mirror. He also painted a three-canvas painting for his brother-in-law. Follow Lutz on Instagram bryan_original. 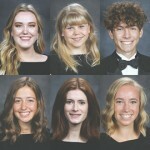 What a great article about a great talented man! Thank you for recognizing his service to the community and country. I enjoyed reading about the how and why of what he does!